Hodgson Mill Spring flows from beneath an old mill building. 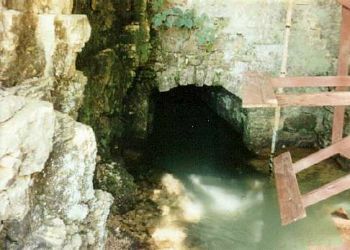 Recharge Area: To the northeast of the spring. First discovered by spring contamination from the Dora, Missouri sinkhole dump, and confirmed by conventional dyetracing. Hodgson Mill, Double and North Fork Springs share a common underground recharge area with a maximum trace of 38 miles and a vertical drop of 665 feet. Interesting Information: Spring emerges from a cave behind the mill, and flows beneath the building. The spring provides a relatively constant flow, for which reason it was selected.The waterwheel visible beneath the building is purely cosmetic, since turbines were used to grind meal. OCDA divers attempted to enter the spring passage in 2002, however it pinched out very quickly. Brief History: Spring was first used as a mill site by William Holeman beginning in 1861, who owned the business for 23 years. In 1884, Alva Hodgson bought the property, replacing the mill with the present one in 1897. The mill transferred to Charles T. Aid in 1934, whose family continued the business until 1965. Other owners ground meal, primarily for the tourist and specialty trades, into the 1970's. Lack of capacity at the mill moved grinding off-site to a modern facility--Hodgson Mill is now a nationwide brand for stone-ground flour products no longer produced onsite. The mill has been restored by Hank and Jean Macler and at last report was for sale. Ownership and Access: Private. One can view the mill and spring from Missouri Hwy. 181 if closer access is not allowed depending on sale status. 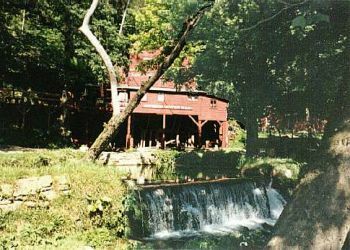 View of the spring waterfall in front of Hodgson's Mill.